These simple little sponge puddings are dairy-free and full of flavour. They are made using Pure Sunflower Spread and Billington's Golden Granulated Sugar. Preheat the oven to 190°C, gas mark 5. Grate the zest from the lemon and set aside, then cut 4 thin slices off the lemon. 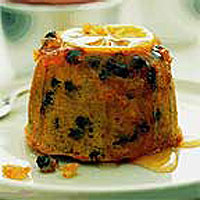 Place a lemon slice in the bottom of 4 greased pudding basins or ramekins, about 200ml in capacity. Drizzle 1 tsp honey or maple syrup over each one. Using an electric mixer, beat the sunflower spread and sugar together for 1-2 minutes, until pale and fluffy. Whisk in the eggs, then sift the flour over and gently stir in with the reserved lemon zest and the blueberries. Carefully spoon the sponge mixture into the pudding basins or ramekins and smooth the top. Place on a baking sheet and cook for 15-20 minutes until risen and firm to the touch. Leave in the basins or ramekins for 1-2 minutes, then turn out onto plates. Serve warm with Waitrose Lemon Sorbet. These puddings can be cooked in the microwave - they don't achieve the same golden finish as with conventional cooking, but the resulting sponge is very light. Because of the speed of cooking, the mixture rises rapidly. Half fill the basins and microwave one at a time on full power for 1.5 to 2 minutes, leave to stand for 1 minute before turning out.